I freely admit that I am a travel gear nerd. I love having just the right suitcase, personal item bag, cosmetic pouch, etc. for my travels. Don’t even get me started on the best noise-cancelling headphones, inflatable neck pillow, eye shades, and …. well, you get the idea. I can deal with TSA regulations limiting carry-on liquids to just three ounces, but the travel gear nerd in me really hates those one-quart baggies. I mean, where is the style in a clear plastic baggie? Just trying to organize my carry-on toiletry essentials in one is nearly impossible. They belong in the fridge with leftovers, not in my carefully chosen carry-on luggage! With this in mind, you can imagine my joy at finding a TSA-compliant substitute for the clear one-quart baggie, one with style and the possibility of actually organizing my belongings. I admit I had my doubts at first - would I really get through the TSA checkpoint with my new toiletry case that most definitely is not a clear plastic baggie? What about when leaving Europe - would it pass muster at security there? I can now happily report that using it on several trips, I have had no trouble at TSA checkpoints in the U.S. or at airports abroad (I’ve gone through security in Pisa, Florence, and Munich with it). I now consider this little toiletry bag to be a travel essential. It holds everything I need on an overnight flight and then some. So, since it is the time of year when you might be looking for a holiday gift for the traveler in your life (hint, hint), I thought I’d share my new favorite travel item. 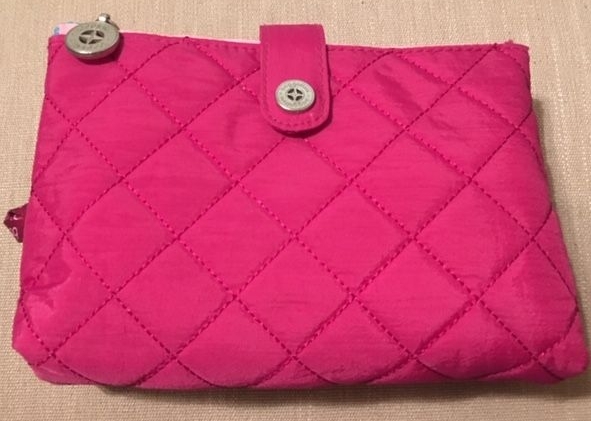 Baggallini makes this “TSA Friendly Toiletry Case” with quilted fabric on the outside. It snaps open to reveal two clear plastic zipped compartments. The separation allows for organization of toiletries and easy retrieval in flight without digging through the jumbled contents of a plastic baggie. The see-through plastic inside, along with its quart baggie overall size, is what makes it TSA compliant.